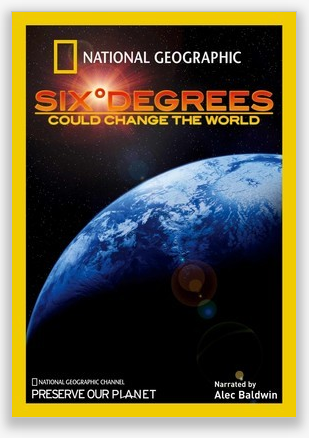 National Geographic created the “Six Degrees Could Change the World” 2007 Documentary. National Geographic’s documentary created in 2007 examines the possible global changes that can occur with just a one degree increase in global temperature up to a full 6 degrees of change. The film is a fairly good overview of what climate scientists predict and many have sadly become all too true in recent years. The “Six Degrees Could Change the World” film spells out the consequences and increased threats to mankind of global increasing temperature: Heat waves, drought, bush fires, rising ocean levels and the ocean becoming more acidic, climate refugees, changing weather patterns, increased hurricane intensity and frequency, and other grim predictions. Some might even go so far as saying the film was a little heavy handed when it comes to dishing out fear. 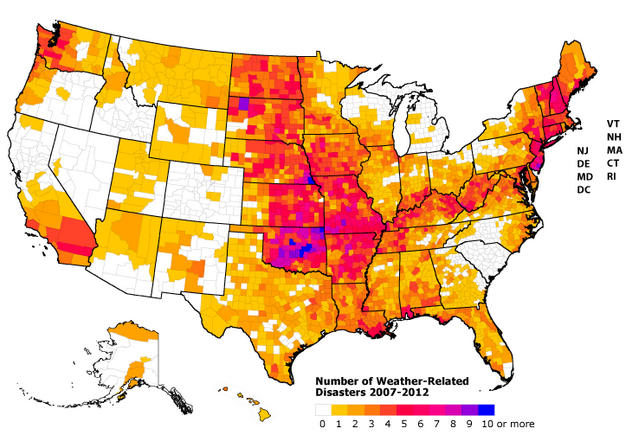 However, a recent released report (April, 2013) from the Environment America Research and Policy Center says 243 million people – nearly 80 percent of the U.S. population – live in counties that experienced at least one weather-related disaster since 2007. The report “In the Path of the Storm,” is based on six years of data on a county-level disaster declaration gathered from the Federal Emergency Management Agency (FEMA). It report also gives an overview of which regions in the U.S. are most vulnerable to various types of severe weather, including hurricanes, floods, drought, tornadoes and winter storms. Of Note: In 2012, the U.S. experienced its hottest year on record and worst drought in more than 50 years. Also when this film was shot the carbon content of the atmosphere was 380ppm, that figure recently hit 400! I give “Six Degrees Could Change the World”: 4 out 5 stars for being able to plant various seeds of possibly taking action on Climate Change and Global Warming. I think the film could have had more emphasis on the various Climate Changes that will occur with an increase of global temperature as too many people get wrapped up in if their particular location such as those that experience a heavy snowstorm, when the planet has been warming etc and those in Australia that have gone from full on drought, when this film was shot to major flooding in the last few years. Besides the 90+% of climate scientists worldwide that have formally acknowledge Global Warming and Climate Change issues ever since the 2007 IPCC report. There has been two other major interested parties that have also started to put out serious warnings about global increasing temperatures: the US Military, which correctly sees Climate Change as a serious national security threat and the global underwriters for insurance companies that have been forced to pay out an increasing number of record breaking claims. Once the largest military force on the planet and the largest companies involved in insurance get involved the topic will become much more mainstream and the chances that positive steps may soon start to happen will greatly increase. With luck mitigation plans will be implemented soon rather than later so that the worse case scenarios never have the opportunity to come into existence.